Modern Art is pleased to announce an exhibition of recent paintings by Ron Gorchov, the artist’s first exhibition with the gallery. Since 1967, Ron Gorchov (b. 1930, Chicago) has worked exclusively on curved surface paintings, rejecting the rectangular format of the conventional canvas. ​“I wanted to change the context of painting because I opposed the ad-hoc acceptance of the rectangle, wanting a more intentional form that would create a new kind of visual space,” he stated in an interview in 2011. 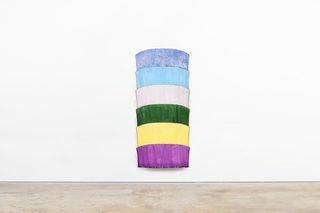 Comprising eleven works executed between 2016 and 2018, including two ​‘stacked’ paintings, the exhibition at Modern Art attests to Gorchov’s longstanding dedication both to painting itself, and to the particular lexicon of forms he has committed himself to over the last six decades. Ron Gorchov first rose to prominence at the height of the New York School, counting Arshile Gorky, Willem de Kooning and Mark Rothko among his friends and colleagues. Following early ventures in abstraction and three successful solo exhibitions between 1960 and 1966, he embarked on a six-year hiatus from exhibiting, during which he experimented with his first structured works. Gorchov initially created a bowed form by dipping wire into plastic liquids; soon after he graduated to concave supports, the earliest of which he produced in Rothko’s former studio. Re-emerging in the mid-1970s in the context of post-Minimal art, Gorchov first presented the distinctive saddle paintings for which he has come to be celebrated. The hewn wooden frames that support these canvases imbue the works with an altogether different energy, appearing as if to flex or spring away from the wall. This dynamism is matched by protean, biomorphic pools of colour described as ​“ribbony ellipses” by the writer Robert Storr. Working in the crossfire of heated dialogues on art, and more specifically, on the contested relevance of painting, Gorchov’s resolute decision in 1967 to turn to a hybrid format intersecting both painting and sculpture situated him in an unchartered middle ground. In-between the integrated forms of Minimalism and the expressionism of modernist painting as it was defined and championed by Clement Greenberg, Gorchov’s curved supports introduced a new identity to painting. His works seemed to be a direct response to the criticisms levelled against minimal painters such as Kenneth Noland and Frank Stella by Michael Fried in his 1967 essay ​‘Art and Objecthood’, yet they did not adhere to Fried’s preferred uniplanar structure. They were neither flat, shaped surfaces actively resisting a more definitive three-dimensionality, nor the rectangular canvases of Abstract Expressionism. Regarded in this context, the saddle works could be understood as Gorchov’s own contention for an ideal form of painting, rallying against the dominant voices of twentieth-century American abstraction. Among his colleagues in painting towards three dimensions, including Frank Stella, Richard Tuttle, Ellsworth Kelly and Elizabeth Murray, Gorchov’s unflinching approach to the medium has produced a lucid and consistent body of work within which minor deviations convey the subtleties of his technique. Gorchov’s paints are often heavily diluted and applied with vigour, leaving the lower edge treated only by gentle drips and other incidental marks. His paintings, which might fittingly resemble shields or masks, possess titles frequently related to Classical mythology. ​‘Anaxarete’, for instance, refers to the Greek maiden who refused the advances of a shepherd named Iphis; the princess Nausicaä, on the other hand, appears momentarily in Homer’s Odyssey as the love interest of Odysseus. If these grand narratives suggest Gorchov’s re-writing of history, they also connect to the broader context within which the saddle paintings first originated and carved their place in a New York story of modern art. Ron Gorchov’s work has been the subject of recent solo exhibitions at Galerie Max Hetzler, Berlin (2018); Cheim & Read, New York (2017); Vito Schnabel Gallery, St. Moritz (2016); Contemporary Art Museum, St. Louis (2014); Centro Atlántico de Arte Modern, Las Palmas de Gran Canaria (2011); and MoMA PS1, Long Island City (2006). Gorchov’s paintings are held by major museum collections including The Art Institute of Chicago; Denver Art Museum; The Metropolitan Museum of Art, New York; Milwaukee Art Museum; Museum of Modern Art, New York; The Nelson-Atkins Museum of Art, Kansas City; and Yale University Art Gallery, New Haven. The exhibition is presented in cooperation with Cheim & Read, New York.